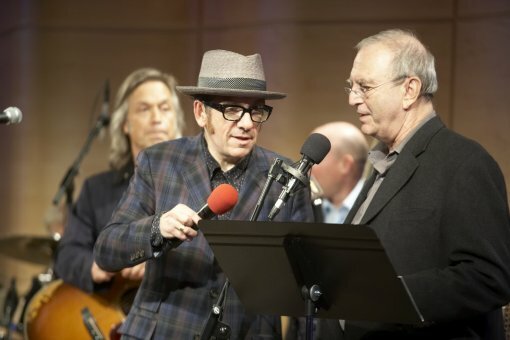 On the eve of the release of his/their new album National Ransom, Elvis Costello and The Sugarcanes played an intimate performance at WNYC’s Greene Space. A video of that special radio gig is available for viewing in its entirety on the WNYC website and tonight (Nov 7) an audio version of the same show will be broadcast on WNYC 93.9 at 9PM. Check out the setlist from the Greene Space gig and other various EC promo clips from this past week after the jump. Listen to Elvis on WBUR, Boston’s On Point with Tom Ashbrook over here. Listen to Elvis on NPR’s Wait Wait Don’t Tell Me over here.